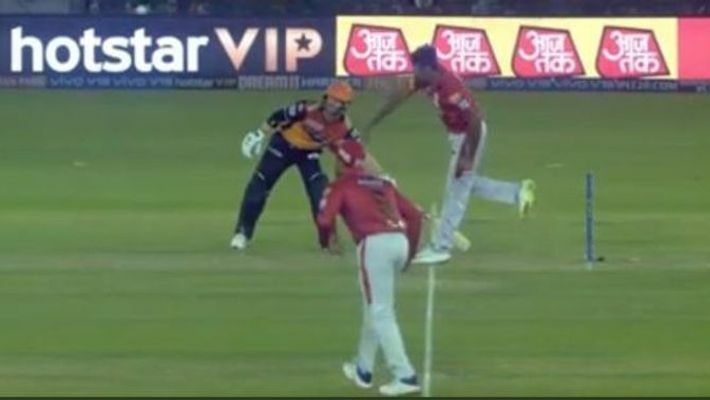 New Delhi: In the match between Kings XI Punjab and Sunrisers Hyderabad on Monday, David Warner was observed to be deliberately dragging his bat inside the safe zone during Ravichandran Ashwin’s over. Warner was being extra cautious to avoid becoming a victim of ‘Mankading’ and the incident was soon uploaded on IPL’s official website iplt20.com. It was also played on the big screen during the match on Monday night. During an earlier match against Rajasthan Royals, Ashwin had dismissed Jos Butler by ‘Mankanding’ him without any prior warning. While this incident created uproar, several people including Harsha Bhogle came to Ashwin’s defence. Shane Warne, on the other hand, had called the act disgraceful and said it wasn’t something he expected from Ashwin. Punjab won the game by 14 runs against Rajasthan Royals and people took to twitter to say that the ‘gentleman’s game’ was being disrespected. Although this law is in the rule book, it is generally deemed as being against the ‘spirit of cricket’. Also read: Ashwin kicks up storm with Buttler run out: Full list of 'mankading' since 1947.